Bank of America Corp. (NYSE: BAC) will stop lending to companies that make assault-style guns for the general public. Anne Finucane, a vice chairman at Bank of America, said, “It’s our intention not to finance these military-style firearms for civilian use.” The bank has already contacted gun manufacturers to tell them it won’t finance their operations in the future. About a half-dozen of the major U.S. gun manufacturers produce military-style firearms. These military style guns are generally sold to civilians and used for non-military purposes. Remington Outdoor Co., Sturm Ruger & Co., SIG Sauer, Vista Outdoor Inc., O.F. Mossberg & Sons and American Outdoor Brands Corp. all produce these types of guns. The gun and ammunition industry earned $51.1 billion nationwide in 2017. Bank of America did not publicly name any of the gun manufacturers it works with. According to records, Bank of America has helped finance Vista Outdoor and Remington in the past. The bank said it will wind down its relationships with the companies that choose to continue making these types of weapons. Bank of America also said it won’t underwrite securities issued by manufacturers of military-style guns used by civilians. The new policy comes roughly two months after the Feb. 14 shootings at a high school in Parkland, Florida, that left 17 people dead. The confessed gunman in that shooting used an AR-15-style rifle. The mass killing fueled a nationwide boycott effort against companies partnered with the National Rifle Association trade group. 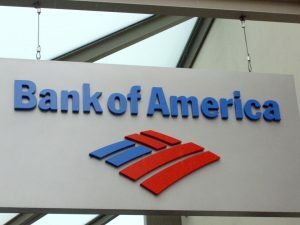 Avery Gardiner, co-president of the Brady Campaign to Prevent Gun Violence, said, “We were heartened to see Bank of America join the list of companies stepping up to keep America safe.” Bank of America is currently the nation’s second-largest bank. Bank of America’s new policy is the latest move taken by a Wall Street institution in the debate over gun control. Citigroup made an announcement last month that it would require business customers to restrict certain types of firearms sales. It also issued a new firearms policy, requiring clients to stop selling guns to customers are younger than 21 or who have not passed a background check.